Women's Growing Connection (WGC) is the women's ministry of CCCH. We want to meet you, encourage your connection with new friends and help grow your relationship with God. All women of the community are welcome! WGC was created with you in mind. Our mission is to encourage spiritual growth, leadership development and Christian connection among women to prepare us for works of service for Christ in our families and communities. "... to prepare God's people for works of service, so that the body of Christ may be built up until we all reach unity in the faith and in the knowledge of the Son of God and become mature, attaining to the whole measure of the fullness of Christ." The Women’s Ministry winter Bible Study begins on Wednesday, January 9 and the evening Bible study starts on Sunday, January13. God’s heart is moved by your cries for help, your shouts for joy, and your unspoken worries. 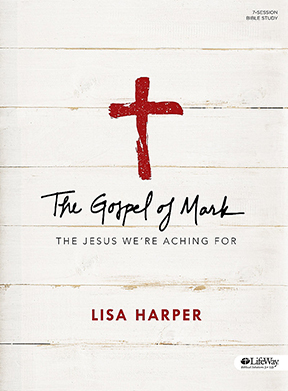 We know Him to be a God of unparalleled power and authority, but Mark’s account of Jesus paints Him as a deepy personal and intimate God too. Join us for a 7-session Bible study to dig deeper into Scripture, understand the depth of Jesus’ compassion and passion for humanity and get to know the real Jesus of Scripture without the lens of man’s perspective. This study takes place on Wednesdays from 9:00 - 11:00 a.m. and on Sundays from 6:00 - 7:30 p.m. You can register and pay on-line or register and pay the first day. Cost of the book and study is $20. Childcare is provided in the morning only. For questions please email Jen Adair for the morning study and Kelli Preto for the evening study. April 26-28 the ladies of CCCH are heading for a weekend getaway to Cedar Lake Ministries. The Ladies Retreat is all-inclusive with lodging, buffet meals, sessions, and free time activities which include pampering, prayer room, kayaking, climbing wall, tomahawk throwing, crafts, campfires, laser combat, Black Hole slide, seminars, chocolate and more. Far Out! God calls us to offer up our bodies and lives daily, to live for Him. The Ladies Retreat 2019 will challenge and refresh you to crave a life lived out in Radical faith, completely and utterly surrendered to God. So pack some rad colorful disco outfits, and get your boogy on! Activities include pampering, prayer room, kayaking, climbing wall, tomahawk throwing, crafts, campfires, laser combat, Black Hole slide, seminars, chocolate and more. Register at cedarlakeministries.org. Cost for the trip is $165. CCCH has a group hold on rooms in Lakeside. The group hold ID is LRClarendon2019. Plus register before February 1 to receive an additional $20 off with the early-bird discount. Contact Sue Plotke if you have any question. There are many ways to get involved with the women of CCCH and the community through the Women's Growing Connection. Some opportunities occur a couple of times a year while others give you the opportunity to serve on a weekly basis. Visit the Women's Growing Connection on Facebook. No account? No problem. You can still enjoy the page, view pictures from our events and videos from previous speakers.